I really didn’t want to write this, but I realize that would be unfair to all of you. …I just don’t want to give up our perfect seats. Amis Trattoria is the latest Vetri restaurant for us to try. Osteria is my favorite go-to restaurant in Philadelphia, and we love Vetri as well. When I saw Amis on The 2011 Philly Mag 50 I knew we had to go as fast as possible (random aside- my goal is to visit all 50 of these restaurants… we’ve been to 13). I made a secret reservation for PhillyBoy and I, had him mark his calendar for a super secret date. I was the wife of the year that night. Amis is my new favorite restaurant. I can’t wait to take my dad there, I can’t wait to go back, and while we were there I wished I had an even bigger appetite than I already do. The restaurant has little faults, but its biggest fault is big. The tables are really close together, so close that you practically hit elbows with your neighbor. As soon as we were seated at our too-friendly table, PB started looking around for a better table. They have a few seats right in front of the chef’s station, and the view is unbeatable. 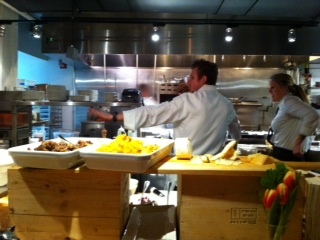 We could see the kitchen in action firsthand, and I loved the thrill of it all. Enough of our secret best table! The food…. the food! We may have overdone it a bit, and PB and I had to roll home, but it was worth every magnificent bite. We had three appetizers and two entrees.. and then the chef sent us another pasta dish that we just had to dig into… and we didn’t stop there. We both really wanted to try dessert since we had been watching them go out all night, so we took one to go and enjoyed it at home after digesting a bit. I probably gained 2 lbs that night. Highlight of the food for me was the zucchini & bufala mozzarella bruschetta appetizer. The bread was crunchy on the outside and soft on the inside (read: just right), and the zucchini and mozzarella combination was brilliant. I need to go back as soon as possible. So all that to say I must really love you all because I shared my little secret.. the best restaurant in Philly and the best seat there. Now, please come visit so I have an excuse to go back! P.S. Check out my latest Babycenter post. @Hope, I know that Vetri gets all the hype, but I really love Osteria and Amis the most.. and they’re so different! Osteria has great pizzas and wine. Amis has great beer, cocktails, and unique dishes! Go try them asap!!! Now that you have endorsed Amis, I’m ready to visit 🙂 If it is half as good as Osteria, I’m in. @Lisa C., If you want to go after work one day for a drink and an app… you know who to call! @RhodeyGirlTests, Definitely. I’d love that! Ahh I just posted TODAY about Vetri! (we’re going in late march for my 2nd time and the fiance’s 3rd!) FROM NYC…Hysterical! Thank you for this post!!!! That’s always the dilemma with sharing a favorite spot. It’s fun to turn your friends onto something new, but then it’s harder to get in! So funny…I’m trying to figure out where we should go for dinner tonight and I’m torn between Amis and Osteria – never been to either one. We did Vetri for our first anniversary…definitely not an every-occasion meal, but it was a fantastic splurge. Oh my, I’m salivating just thinking about your meal! Sounds like an amazing night and I love restaurants where you can see the chefs cook. It makes it so much more of an experience to savor! I have been wanting to go to this mark vetri restaurant! I have been to osteria and my family LOVES it. my sister went to vetri a few times with her boyfriend (i have not been- its muy expensive but i heard its beyond amazing). I expected no less from Vetri for his Amis restaurant…so excited to try it! A gift card to Amis has been burning a hole in my dad’s wallet. If he doesn’t use it in a week, I might steal it from him after reading this post! @Juliette @ Finish Your Broccoli, Steal it!!!!! !